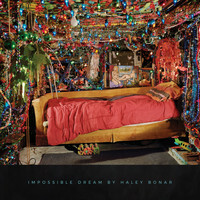 Having broken through with 2014’s Last War, Haley Bonar has gone one better with this August’s universally acclaimed Impossible Dream. We caught up with the Minnesota-based singer-songwriter at the end of a whirlwind fortnight in the UK, to find out the story behind her latest LP. You’ve had a crazy few weeks here in Europe. You must be exhausted? What has been the highlight of this particular trip? There have been so many! But I think playing on the Jools Holland show with The Temptations was hard to top. Music is the only art form where people assume that your work is completely autobiographical. Is live TV as terrifying as it appears? You know, it wasn’t that bad because they have a studio audience in there. I mean, I’ve done a lot of recording on the radio and I have done some TV stuff – though not that big – but it’s better to play to people in the room and try to forget that it’s being broadcast. I was mostly just nervous right when we pulled up; I had to run to the bathroom because I saw the studio and I was like, “Oh my god!” (Laughs) But it was totally fine. As per your last album, Impossible Dream has had a fantastic reception in Europe. Why do you think audiences are connecting with your music so strongly now, at this relatively late stage in your career? You approached Last War from a slightly more “rock” perspective than previously. Was there any goal this time round? Not particularly. It wasn’t really a conscious decision until we were really close to being ready to actually record. But I had initially thought this record was gonna sound like Fleetwood Mac. It kinda does have a little bit of a tough vibe to it, but I didn’t really intend to have this much rock on it. The first song I wrote was ‘Better Than Me’, and then I wrote ‘Hometown’ and then there was a bit of a space between writing the rest of it. And then once I figured out the underlying theme of whatever I had been working on, I just picked which songs made the most sense together. It felt a little disconnected because some of the songs were written a year or two before the others, but the last half of the songs were written in pretty quick succession. Was there anything about the creative process that you approached differently? Yeah, because I had not worked with another producer before. My friend Jacob Hansen – who co-produced this record – he’s been playing music with me for a long time, so it was really helpful to have somebody to bounce ideas off. Like, when you first write something, you can just say, “Hey, what do you think of this one? What can we do to it? How can we makes these ideas fit together?” So that aspect was pretty different, but very positive and so much more enriching. The press release that accompanied Impossible Dream very deliberately emphasised that there is no one narrative to the album. Is that a consequence of Last War being read as autobiographical? Where were you looking for inspiration? ‘I Can Change’ is a real standout. Can you tell us about the story behind it? Lyrically, I was writing it from a place of reflecting on how much we criticise and tend to berate ourselves for who we are, and tell ourselves that we need to be better. I’m always thinking about that; I always want to change and be a better person, I think everybody does. But it’s really difficult to do that and it’s also difficult to be good to yourself, and love yourself unconditionally, and realise it’s ok to make mistakes. So that song to me I just think about it as a song of the ego, and being self-critical. You’ve been playing music professionally for pretty much your whole life. How have your motivations have changed? I mean, I don’t think I was very motivated when I was really young; I just did it, and I didn’t have any expectations or any big goals. But I have a child now so I have to support my family, and I don’t really want to do anything else so I have to take it a little bit more seriously, and set bigger goals and be motivated by my own creativity, trying to explore new avenues within writing and producing and songwriting.